The SAMSON SB drip hose booms from 12 to 24m working widths. They are available either with a fixed working width or as combi booms with adjustable width. The SB booms can be mounted with ADS (Anti Drip System).Drip hose booms from SAMSON have a master/slave cylinder system which ensures that the boom folds in and out at the same time. The SlurryMaster 6000 ensures automatic and intelligent control of all hydraulic functions when starting and stopping the spreading – the driver only has to activate one button. 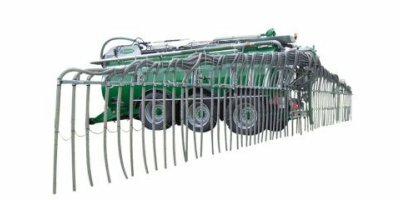 The drip hose booms are fully galvanised and built with a trapezium suspension which ensures that the boom always follows the surface of the ground, even on hills. The boom is raised and lowered hydraulically, and when the boom is folded along the sides of the slurry tanker during transportation, it is inclined, so that the slurry runs back to the distributor and does not drip from the hoses. All SAMSON’s drip hose booms are mounted with a vertical distributor with a dosing capacity of 4,500 l/min to 14,000 l/min. No reviews were found for Samson Agro - Model SB 12-24M - Drip Hose Booms. Be the first to review!